With another summer winding down, it’s time to start thinking about the new school year. Whether you’re sending your kids off or going yourself, there’s a lot to do to get ready. We at your library are ready to help you and yours meet the new challenges the year will bring. Math is a subject that many are looking for help with, and we’ve got some great free resources which can help. As always, all you need is a library card. Sometimes just making a subject more fun can be a great way to get better. Books like Train Your Brain To Be A Math Genius are fun and can help build essential skills, and we have lots of educational and fun resources. The Book of Perfectly Perilous Math by Sean Connolly can help with learning while allowing kids to forget they are doing work. Mystery Math: A First Book of Algebra by David Adler takes you through a haunted house with math behind every door. Eat Your Math Homework: Recipes For Hungry Minds by Ann McCallum allows kids to be introduced to concepts like fractions, variables, Fibonacci numbers, and more through some tasty recipes. There are also inspiring books for young minds like How Fighter Pilots Use Math and How Astronauts Use Math which are both by Mary Hense. If those sound too advanced, you can start with the basic concepts. There are books on numbers, shapes, measuring, and many items like Money Math With Sebastian Pig And Friends. Storybooks involving math are a great way to help your child get a leg up. There are many titles to choose from, including Math Potatoes, Mice Mischief: Math Facts in Action, How High Can A Dinosaur Count? If homework help is what you’re looking for, there are some great series to check out. The Ontario Curriculum is a great tool you can browse to see what needs to be known at what level. More than just math, the curriculum is what teachers use to determine what they need to teach. Other books like the SkillSmart series are also useful. They can help build language and math skills for those in grades 1-7. The Key is another series which can be used for math, science, languages, and more. Complete MathSmart (for developing and improving math skills) is another series which can help. We have math book for all grades, ranging from skills needed for kindergarten through to what students need to prepare for university and college level math classes. Books like Pre-calculus Demystified and Algebra for Dummies can help people become math experts. 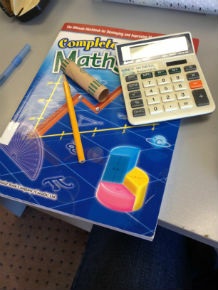 WPL has math books for everyone! Databases are another great way to excel this school year. They’re great for all subjects, and you will want to find the database that best fits your information need. (There’s a full list here:) One that’s great for learning math, and other topics ranging from TOEIC, TOEFL, SATs and more is the Learning Express Library. It’s discussed in a blog in greater detail here. The LEL’s are a great tool you can access from home, on campus, at work, or wherever you need to be. We have literally hundreds of items on math concepts, problems, and even mathematicians. We also have items that can help you understand how people learn math, with works like Welcome To Your Child’s Brain: How The Mind Grows From Conception To College. While I can’t list them all, we’ve got what you need to help you or your child become an expert mathemagician. Soon, you’ll be able to help anyone mesmerize by making the remainder disappear – or solve other problems that maybe don’t come from The Simpsons.